⊕ Well fit and great envelopment on the calf. ⊕ Shiny to glossy depending on amount of light it receives. The packaging is quite similar to that used for tights. 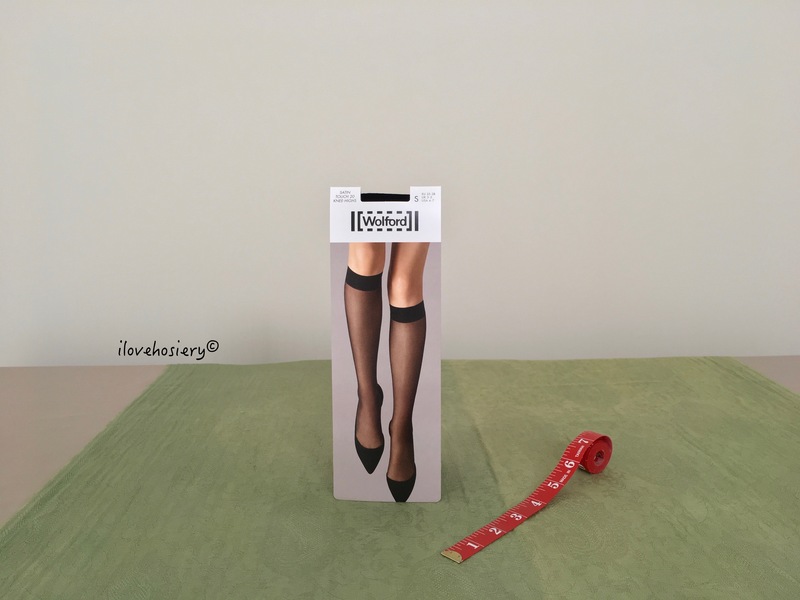 One minor difference is that Wolford uses a two-fold cardboard for knee-highs. You have to hold the cardboard firmly so the contents won’t slip out when unwrapping. Satin Touch 20 knee-highs are 20 denier appearance in shiny fashion. It has a relative soft and smooth texture. 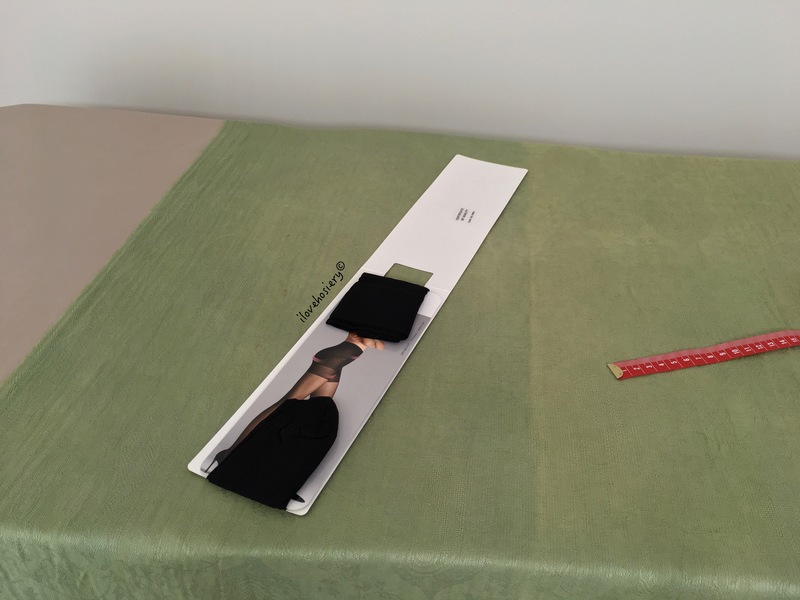 The total length measures 39cm when laid flat. The cuff measures 4.5cm wide, and the circumference 18cm. The knee-highs appear to not have undergone boarding, thus one can wear them back to front. The toe section is lightly reinforced (shadow toe). Wolford Satin Touch 20 Knee-Highs promotional image. There are only two sizes to choose from: S and M. These correspond to womens’ shoe sizes. I have included the size chart for your reference. At the time of writing this review, the number of colours available is different among countries. In Austria and the U.K. for example, there are 11 colours (as shown below). 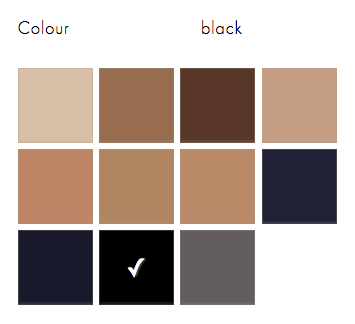 Whereas in the U.S. Online Shop, there are 14 (additional colours are: Honey, Mocca and Nearly Black). I have used Black in this review. I thought it was going to be too small by the looks of it, but the fit turned out to be very good. For your reference, my foot is 25.5cm long (EU size 39.5) and the length from the ankle to the tibia tuberosity (the protrusion just below the kneecap) is 32cm. This led me to question how Wolford sets the criteria for sizing. The envelopment was also good by the way. The cuff was a little tight for me, but then it sat very well and didn’t budge down even after prolonged wear. The appearance was virtually identical to that of Satin touch 20 tights. It can exhibit from shiny to glossy, depending on the amount of light the tights receive. The shadow toe has a relative sheer appearance, hence you can pair it with open-toe shoes with ease. The texture is relative soft and smooth. The cuff was a bit tight, but not to the point of uncomfortableness. The breathability was relatively good. The Satin Touch 20 knee-highs are basically a shortened version of the Satin Touch 20 tights. It has all the great features seen in the latter. The knee-highs serve a good alternative if you don’t feel like wearing tights. It is also difficult to differentiate if you hide it under trousers or long skirts. In my previous knee-highs review, I had a size M Luxe 9. Despite the size recommendation, it was rather large for me. For this reason, I decided to try out the small size, which to my surprise worked. I find 170cm to be a good cut-off between size S and M.
The Satin Touch 20 Knee-highs is available year-round for €15 or £15. The range also comes in tights, stay-ups and socks. If You want to find out more about Satin Touch 20 Tights, you can find my review here. Does freezing the tights makes them more durable?